The Guild of the Cross is an interdenominational Christian student organisation at Aalto University founded in 1947. We share a faith in Jesus Christ, our Saviour. 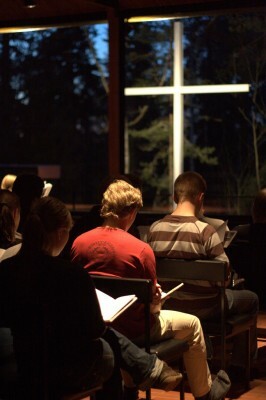 Our meetings are held every Wednesday at 18:45 at the Otaniemi Chapel. The evenings are held in different locations during the renovation of the chapel, which began in October 2018. The evenings typically consist of a teaching (usually in Finnish) on different matters of Christian life, hanging out over an evening snack, and a devotional at the end. Our other activities include an annual trip to Lapland, sauna parties, the Autumn and Spring camps and sports activities. The guild members know what is happening in the Christian scene in the capital region and will be happy to help you. If you need further information feel free to email tiedottaja at ristinkilta.fi.